DCCI Vice President K. Atique-e-Rabbani welcomes the Chinese delegation from Chenggong, Kunming, China led by Li Ronghua, Executive Deputy Director, Chenggong New District Administrative Committee, Kunming, at the DCCI auditorium in the capital on Thursday. Members of the Board of Directors of DCCI were present. 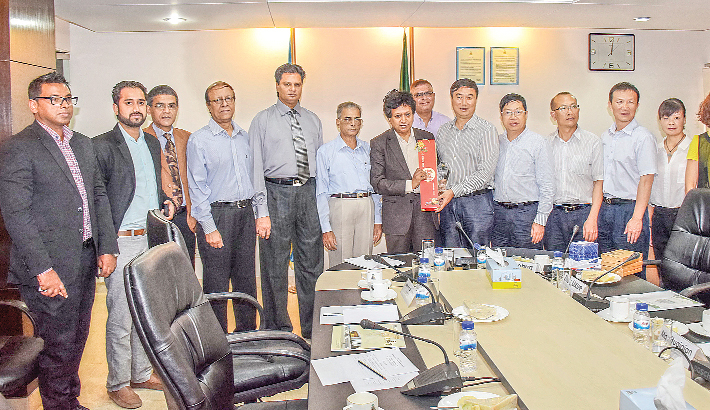 Dhaka Chamber of Commerce and Industries (DCCI), the country’s largest chamber on Thursday called upon a visiting Chinese business delegation for making more investment in Bangladesh. Chinese delegation from Chenggong, Kunming, China led by Li Ronghua, Executive Deputy Director, Chenggong New District Administrative Committee, Kunming, held a view-exchange meeting with the members of the Board of Directors of DCCI at the DCCI auditorium. DCCI Vice President K. Atique-e-Rabbani, FCA, presided over the meeting. While addressing, Atique-e-Rabbani invited the Chinese entrepreneurs to invest in Bangladesh, especially in the agriculture and the ICT sectors. He said Bangladeshi ICT sector is a thrust sector and the young entrepreneurs are very enthusiastic and innovative here. “Bangladesh is doing well in software industries and Chinese entrepreneurs can collaborate with Bangladeshi IT professionals as joint ventures in order to share technology. The direct rail and road link with Kunming as well main land of China would reap good results in terms of business”, Rabbani added. Li Ronghua said Bangladesh has huge fertile and plain land which is potential for agriculture. He said Chinese entrepreneurs are interested to invest in agro-based industry in Bangladesh. Kunming is rich in agriculture and flower cultivation. He added. “Bangladesh can import more flower from Kunming. In Kunming, there is an industrial zone especially for micro industries where Bangladeshi SMEs can invest”, Ronghua added. He requested the DCCI to send delegation from Bangladesh to explore new business opportunities in China. DCCI Directors AKD Khair Mohammad Khan, Asif A Chowdhury, Md. Aladuddin Malik, Ryiadh Hossain and Secretary General AHM Rezaul Kabir were also present during the meeting.